Of all the holidays Christine and I celebrate, the nearest and dearest to our hearts is ironically the only one that is not celebrated in France. Thanksgiving is an American holiday but it has a very universal appeal. It is rooted in the harmonies of nature, both human and environmental. It is a time when people come together in cooperation, preparation and appreciation of what life is all about; the harvest is in, the food pantries are full, the wine has been pressed, wood has been stockpiled and the winter is knocking on our door. It is time to celebrate the full abundance of life with good family and friends over the best and most fantastic food and drink that is available. It is time to make that special recipe with all the right ingredients, or open that crazy good bottle you had been saving for the right occasion. The occasion is now. It is time to eat, drink and be merry for so many reasons worth counting. As Christine and I count our reasons to be thankful we think of our family, friends and business associates and we wish you all a very, very happy and joyous celebration. But don’t forget.., the Mayan calendar ends sometime in December and you can’t take it with you, so drink up! Cheers, and Happy Thanksgiving! Having taken the semester off from my teaching responsibilities at the local university, I’ve been able to devote more time in general to Heavenly Spirits and in this case join CC on a trip that included stops in Florida and Georgia. On the first leg of our trip we got to spend time in Florida with old San Francisco friends Bob & Debra Ackerman. We don’t know any couple more dedicated to experiencing the worlds of fine food, wine, spirits and travel than Bob and Debra. In addition to catching up with each other's recent experiences we spoke about the Florida market and options for Heavenly Spirits expansion. 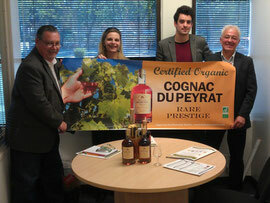 In the third week of our so called “vacation” we took two separate trips toward the city of Cognac to visit with producers and product packaging suppliers. 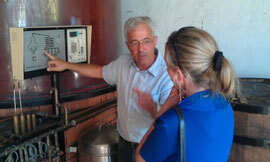 On a Tuesday we visited with our very good friend Alain, a certified master blender of distilled spirits. As usual he insisted we eat at his and now our “favorite restaurant in Cognac,” Le Patio, where the food is always amazing, the service friendly and professional, and the prices more than reasonable. We enjoyed incredible salads and got caught up on variety of project ideas. After lunch we headed off to meet with the Filloux family at Cognac Jean Filloux, located in the famed Grand Champagne area of Cognac. Though we have been here before, we took this opportunity on a perfectly sunny summer day to tour the entire operation and grounds, learning some of the fascinating history along the way, while tasting new blends and delicious little “financiers” cakes. Finally, two days later we traveled to the medieval village of Pon and met with the impressive business team of Lise Baccara, producers of the wonderful aperitif, La Troussepinete. We learned much about the history and development of the company and many of their fine products as told by the founder, inventor, and master liquorist, Gerard Paignon, who was aided by not one but two English speaking members of their team. All in all it was a most productive meeting and we look forward to continuing the dialog as we move ahead promoting this amazingly delicious aperitif. 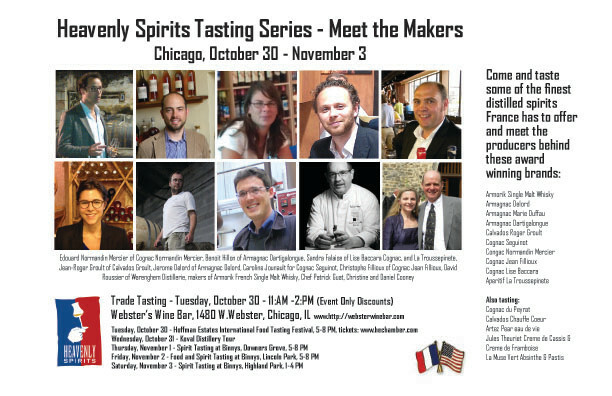 Sandra Falaise, director of international sales will be traveling to the US in October to join us with Chef Patrick Guat and several of our other producers in Chicago where we will be conducting a series of informative Heavenly Spirits Portfolio Seminars and Tastings. We look forward to seeing a good amount of Chicago area spirit fans to come out for these unique events. See Gallery here for more photos. Our most involved meeting, that took place during our second week might have been the overnight journey we took to Lannion, to tour the Warenghem Distillerie. Located in the Brittany region of France it was a rainy five hour drive from La Rochelle in each direction. It was the first time either Christine or I had been to Warenghem to see how they produce the best single malt whisky made in France. Hosted by Directeur Gilles Leizour and his son-in-law David Roussier, it was a fascinating and informative experience that encompassed the history of the distillery and their particular art for making high quality single malt whisky, as well as other assorted spirits and beer. As I am writing this and remembering all we learned it is becoming clear that I could write a post for each and every product Warenghem produces, but I am not going to do that. Instead, I am going to provide you a link to the Warenghem web site and share some of our photos with captions of our day spent with Gilles and David. Specializing in Celtic spirits, Warenghem Distillerie is a very impressive, well established, multi faceted operation that produces several versions of their very tasty, well balanced, high quality, single malt whisky. Made with malted barley grown in the East of France and crystal clear granitic water from their own protected aquifer source located directly beneath the distillery. The mash is double distilled using a traditional copper cognac still and the spirit is then matured in wooden casks for many years. The way the barrels are used combined with the type of wood and the local climate are keysto obtaining the rich nuanced taste of ArmoriK Whisky. 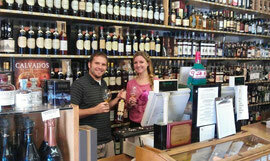 We are very pleased to be representing this world class whisky and encourage all single malt fans to give it a try. I think you will be pleasantly surprised. The city of Lannion is a charming Breton town, especially on market day when the central area near the salty river is filled with tables and stands of locally produced wares of all kinds, including: cheeses, wines, baked goods, assorted crafts and much more. Locals and tourists flock to the market, streaming in from all directions. In the summer months the Warenghem Distillerie runs free tours and tastings every hour, open to the public and it is a very popular destination indeed, especially on overcast summer days. See the Gallery (part 2) for more photos and information. Click here for the Warenghem web site. Can you still call it "Vacation" if you enjoy your Work? With our visit to La Rochelle, France now complete, I’m going to try and get caught up on sharing some of the food, wine and spirit related experiences we had during our stay. Our first day of meetings began only a few days after arriving in La Rochelle. We headed to the city of Angouleme and were hosted for the day by Angouleme based Chef and Culinary Professor Patrick Guat, a man with a gift for bringing people and high quality food products together. In a series of visits and meetings, Patrick had arranged for us to see a number of exciting regional products and meet the entrepreneurs behind those products. We started by meeting Raynal Geoffroy, the force behind OBO premium soda, a wonderfully refreshing concoction that tasted to me like a cross between Dr. Pepper and some kind of ginseng energy drink. Made for the most part with healthy ingredients like ginseng and grapefruit and with much less sugar then most American soft drinks. It seems to have struck a chord with pre-teens and thirty-somethings here in France. They might be looking for someone to introduce it to the US market. I have to say, the product has a lot going for it, including a well thought out and professionally designed graphic identity. Of course we specialize in French spirits, not carbonated beverages, but we are aware that one does have to at least consider opportunities wherever they present themselves. 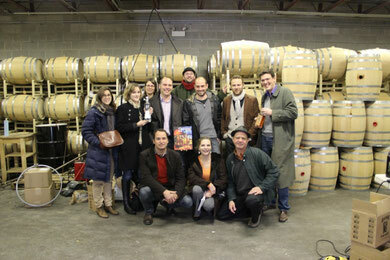 After lunch we headed off to see Jacquiot, a producer of Creme de Cassis and other liquors. We were greeted by Mr. Chaignaud, his wife and his lovely English speaking daughter, Clemence, who shared with us the history of the family vineyard and distillery. We tasted several of the products and toured the production facility, where they had just finished making and bottling this year’s limited yield of crème de cassis. We now have an option to import some of it fpr the US market. While exiting the bottling room, I noticed a curious item (made famous to me by conceptual artist, Marcel Duchamp). It was the first time I had ever seen a traditional French bottle drying rack, actually being used to dry bottles. We already represent a crème de cassis made in the Dijon area of France that many of you know is quite good, so we were very surprised at how tasty this one was, made in the Charente. The main difference we found between the two was that the Jacquiot version had a burst of natural fruit tartness different from our Jules Theuriet brand. Both are just wonderful products and serve as the main ingredient for the Kir or Kir Royal cocktail so popular here in France. In fact these crème de cassis can be used in a variety of ways to improve or enhance almost any dessert. Later that evening we were invited to Patrick’s home where we were treated to an amazing five course meal prepared by Patrick where he used the crème de cassis in a delicious savory sauce served over quail. I tell you, it was a day and a meal to remember. Heavenly Spirits is pleased to announce that five of our products have been selected for the List of 140 BEST Five Star Spirits in the World. Three of those products are rated at the top of their respective catagories, including top rated Cognac, top rated Armagnac, and top rated Blanche Armagnac. To read a description of each of these products written by the judges and to see product's overall position on the list, take a look at the gallery. Congratulations to the producers of these fine products. There are lots of reason we like to travel to the golden State; 1, it was our home for ten years, and 2, it’s the biggest market in the US for our Heavenly spirits products. On this occasion we had the opportunity to participate in the first ever LA Cocktail Classic, sponsored by Eat, Drink, Play, so that was more than enough reason for us to go. In order to get the most out of our trip we decided to stop in the San Francisco Bay area on the way. We were not the only ones. We soon discovered from the police lined streets as we entered the city, that someone was following us. We pulled over to see what was going on and two minutes later President Obama and his convoy drove past. I have to admit, I was a little disappointed that the special welcome wasn’t just for us. None the less, we felt plenty welcomed when we visited our distributors and some of the fine retailers who carry our products. We showed a number of products wherever we went, including La Troussepinete, the wonderful French aperitif new to America from the Vendee region. We were pleased to find out that everyone who tried it loved it as much as we do. (We learned it even goes well with Spam.) For our last night in the North, we poured a variety of Heavenly Spirits for a very appreciative crowd of consumers at K&L in Redwood City. Our thanks go out to David & Kyle for organizing that event. After a quick presentation of La Trousse to the the Epic team, we left at mid-day on Friday, destination LAX. For the first time ever, we had a well meaning but over-zealous United check- in staff member question how we packed our bottles in relation to their new system. This guy ended up gifting himself a sample bottle of a wonderful new coffee flavored liqueur, produced in Northern California, called “FIRELIT.” As disappointing as this loss was, we were lucky enough to come into a replacement bottle later that evening at the LA Cocktail Classic, via Eric at the Bock table next to ours . 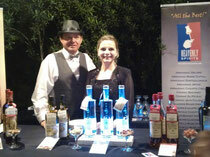 Held at the Vibiana, a former cathedral located in Down Town Los Angeles, the Cocktail Classic tasting was indeed a class event. 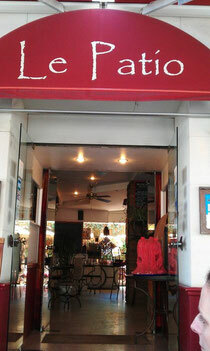 We had a perfect location for our table outside on the well lit patio, plus we had the pleasure of Lanee Lee Neil ‏@wanderlushdiary, a talented LA lifestyle writer/blogger helping us pour. The temperature was perfect, the music was good and all the attendees looked like movie stars. It’s an event we thoroughly enjoyed and would like to do again next year. See our gallery for more photos and see this link for more info: (http://www.thrillist.com/bars/los-angeles/ca/90012/downtown-/la-cocktail-classic_bars_cheap-drinks_great-cocktails_events). 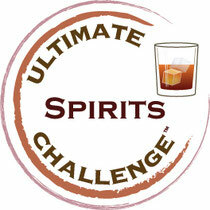 "Ultimate Beverage Challenge’s mission is to create and establish a new and higher standard of evaluation for spirits and wine that provides accurate, meaningful and useful results in recognizing and promoting the quality of beverage alcohol products. It accomplishes this by the integrity of its people and approach, its innovative and exacting methodology, and through the credibility of its results." Heavenly Spirits of Lakeville, MA is pleased to announce that the top two winners of this year’s Ultimate Spirit award for an aperitif is La Troussepinette Red, and La Troussepinette White by Lise Baccara. The Red version of La Troussepinette earned the highest score and the Chairman’s Trophy with 96 points, followed closely by La Troussepinette White, which earned an impressive 95 points to place second. 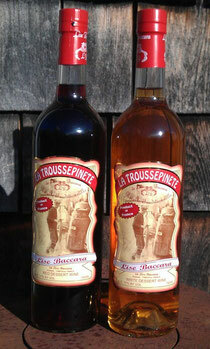 An ancient traditional aperitif, La Troussépinète has its origins in the Vendée, a coastal region north of Cognac. It is believed that it was made clandestinely by the unofficial distillers of the Vendée who were not granted the right to distill by the French authorities. Since ancient times, we know that wines of mediocre quality were flavored before being consumed most of the time. The upper classes were able to flavor their wines with expensive imported spices and plants such as cinnamon, ginger, cloves or rose petals. The people with less means had to use their imagination and find other local ingredients. In the Vendée, a lot of farmers had small vineyards but the wines produced were only ordinary in quality. However, there was a lot of blackthorn bushes and the winegrowers and distillers started to use it to make troussépinètte wines. The French word for “blackthorn bush” is “épinète,” which we find in the name troussépinètte. 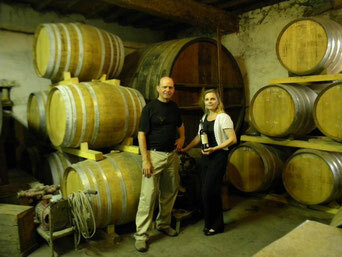 The Lise Baccara Troussépinètte was created by Gerard Pagnon, a small wine grower and liquoriste from the Cognac area. There are a few different ways to make troussépinètte but Gerard uses the original ancient recipe. Young blackthorn shoots are harvested in the spring, then sliced up and allowed to macerate in low alcohol cognac for 1 to 2 months to release the sap. Wine (red or white) is added, as well as some sugar and the blend is adjusted to a final content of 17%, then filtered and bottled. troussépinète, only the spring shoots full of sap and almond like flavors. We are doing our best to introduce this wonderful product to all of our distributors as fast as we can. If you don't yet have it available in your State, you can order it on-line from one of our recommended on-line retailers. The second part of our Left Coast tour took us in and around Los Angeles, CA. 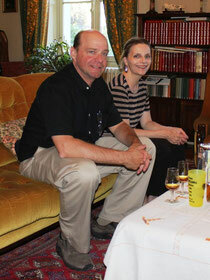 Our primary reason for the visit was to work with Jean-Francois Rault, owner and producer of Cognac DuPeyrat. 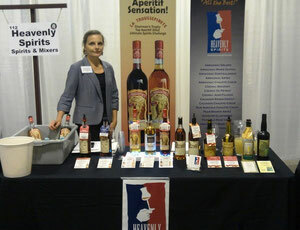 He was participating in the annual Expo West, organic trade show, held each year in Anaheim, and we were there to help. The show was very well attended and for the first time ever, they grouped all the organic wine, beer and spirits producers in the same ball room. Everyone agreed it was a good idea. The convention is one of the biggest in the industry and there was a lot to see, smell, taste and talk about. Mr. Rault’s son Antoine was also present and together the four of us visited some of Heavenly Spirits’ top accounts in Southern California, including: High Time, Beverage Warehouse and the Hollywood location of K&L Merchants. We have been invited back to Hollywood later this year to participate in a “Speak-Easy” themed tasting and we hope to be able to do it. Just for kicks, we also stopped in to check out “Whiskey a Go-Go,” a landmark club in the American music landscape and a special request by Antoine. Altogether, the weather was fantastic for most of our four day visit, allowing us to move around quickly and comfortably. 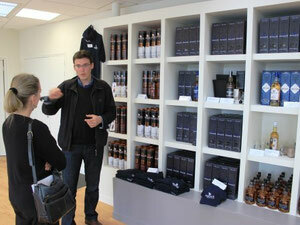 It was a great opportunity to meet so many fans of organic products and quality French spirits. California remains our largest market and so we will most likely need to visit ever more frequently in the future. Because we are the proud parents of two boys, and because I am an adjunct professor at a local university, Christine and I seldom get to travel together. Fortunately, this past week it worked out and I got to spend my “Spring Break” working in California. While I am not nearly as known or experienced in the field as my charming partner/wife Christine, I believe it is good for folks to know who I am, and for me to know them. This was a whirlwind six day trip for me and a nine day trip for CC, packed with lots of meetings and moving about to and fro. Objectives of this visit included introducing a few new products and/or packaging designs, participating in the Expo-West trade show in Anaheim with one of our producers, and having the opportunity for me (the lesser known partner) to meet many of our distribution associates as well as our retail and on-premise clients in CA. Because we have such interesting and dedicated people in our network of associates and friends, the experience was a true pleasure. If Heavenly Spirits continues to grow at the pace it has over the past two years, we will be taking even more trips, together or individually just to keep up with the growth. Our week began with a Heavenly Spirit tasting put together by Brian, of Epic Wines, held at La Mar Restaurant at the Embarcadero. The Peruvian cuisine was amazing; stunningly beautiful to look at and delicious to eat. Conversation was lively and quick as those in attendance took time in the middle of a busy work day. For the next two days we visited a variety of Bay area Heavenly Spirits’ clients, sometimes in conjunction with one of our distributor’s sales representatives. One of these clients, D&M Wine & Liquor Co. is particularly well known for their knowledge of Armagnac and other French Brandies. 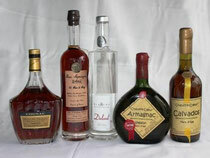 They even have individual, connoisseur buying clubs for Armagnac, Cognac and Calvados that you can join and learn about on their web site: http://www.dandm.com/aboutus.php. What really impressed me at their Fillmore Street location, and I have never seen anything like it before in a store this size, is their “Wall of Armagnac,” pictured here. While we had the opportunity we sampled owner Karen Politz and two of her staff on several of our newer products which they seemed to enjoy. Please check them out the next time you are in San Francisco. This Blog post is dedicated to all who have helped Heavenly Spirits grow in 2011. We salute our producers, transporters, distributors, agents, retailers and especially our consumers, for helping us put together our best year yet. Available now in more than seventeen US States, Heavenly Spirits strives to represent the absolute highest quality artisanal spirits made in France. The market has responded exceptionally well to our efforts supporting our placement of at least seven new products in 2011, including: aperitif Troussepinete, cognacs from Jean Fillioux and Normandin Mercier, vintage armagnacs from Dartigalogne and Delord, as well as new packaging for three of our other products; Armorik French whisky, Du Peyrat Organic Cognac, and the Delord Armagnac line. Christine and I feel especially lucky to be building this business with such an increasingly knowledgeable and appreciative demographic forming in the marketplace. It is a demographic that has grown out of the American wine movement which exploded thirty years ago as well as the more recent demand for quality craft beers. 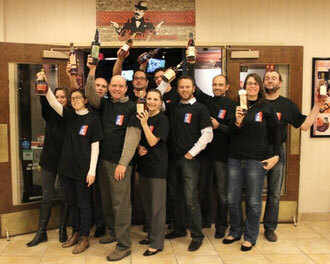 Of course distilled spirits have their own historic roots to build on in America and abroad. A lot of folks, especially baby boomers are becoming interested in learning more about spirits and gaining a better understanding of how and when to enjoy them. We are happy to oblige by offering seminars and tastings at every available opportunity. One of our most popular seminars in 2011 is called “Cognac vs. Armagnac.” We talk about the differences and similarities of these two great French brandies and offer fantastic tasting examples straight from our award winning portfolio in support of our words.